In the same way that a house design benefits from the expertise and vision of an architect, so too does a garden benefit from the abilities of a trained garden designer. The difference between creating an outdoor space that is merely average and an outdoor space that is stylish, functional and practical is often the skills of an experienced designer. Our garden designers will combine your requirements, along with your budget, style preferences and any existing features and surroundings, all into a unique garden or outdoor space individual to you. Our garden designers will work collaboratively with you at all stages of the design process. 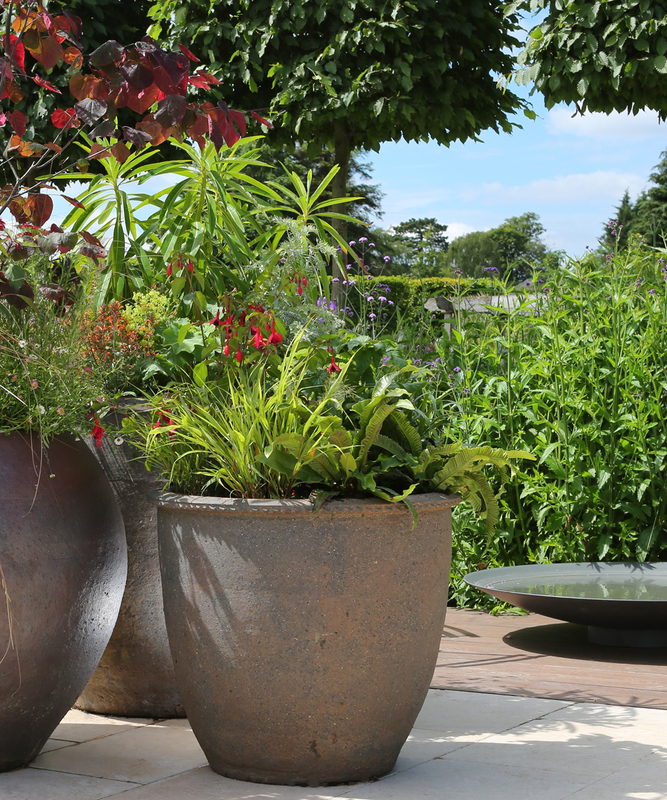 Although we'll make use of our extensive experience and skills in suggesting schemes and styles, we aim to ensure that the resulting garden is one that is unique to you, a place for you to express your own character and ideas. We feel that designing gardens is an exciting and inspirational experience - and we want you to think so too. Our garden designers are not just artistic and creative, but are also experienced professionals, trained in the numerous skills which contribute to the success of a good garden design, ranging from site surveys to concept plans, and from planting plans to complete master plans. Our garden designers also have the benefit of working alongside other professional specialists at Clifton Nurseries, ranging from landscapers to tree surgeons and from plant specialists to irrigation experts. Did you know that our garden designers are also experienced in designing outdoor kitchens?! Eating outdoors has never tasted so good thanks to the latest new products. Combining cutting-edge technology with innovative design, the Fire Magic collection of luxury outdoor kitchens sets the gold standard for alfresco entertaining. Add to this numerous other options including authentic Italian Alfa Pizza wood-fired pizza ovens and built-in firepits - and the ultimate outdoor dining experience can be guaranteed. The concept of outdoor living is an increasingly popular trend that involves extending your indoor space to the outside - we think of it as 'bringing the indoors outdoors' and your outdoor space can now be designed using the same principles as for indoor rooms. The space can be divided up into different functional areas - perhaps a kitchen, living room, games area - and each space can be designed with that in mind. The 'floor' may be made of grass, stone, decking or paving; 'walls' may be made of hedges and fences; 'ceilings' to protect you from the elements can be created with arbours, pergolas and canopies and plants can be used to add colour and texture to each 'room'. We're inspired by clients who want to push the creative boundaries and we're always up for a challenge to create something completely new and original. Advances in technology, materials and design now mean that there is a range of fabulous products available, all suitable for the outdoors. Team those with beautiful and stunning plants and the end result can't help but impress. If you want a truly unique space for entertaining and relaxing with friends and family in comfort and style, contact our garden designers and benefit from their expertise to create a stylish space that offers all the benefits of the outdoors whilst retaining the comforts of the indoors.